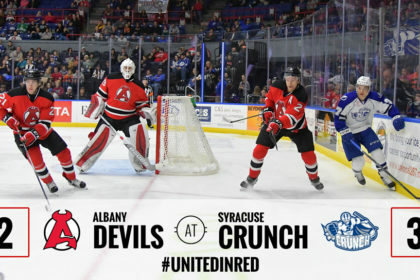 ALBANY, NY – The Albany Devils erased a two-goal deficit only to fall to the Syracuse Crunch with 1.9 seconds remaining in regulation. 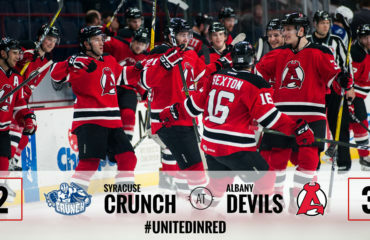 Erik Condra scored the game-winning goal in the Crunch’s 3-2 victory Saturday at the War Memorial at Oncenter. During the winning play, Joel Vermin drew in several Devils’ players high in the slot. The puck found its way to Condra, who skated around Mackenzie Blackwood before the buzzer sounded. 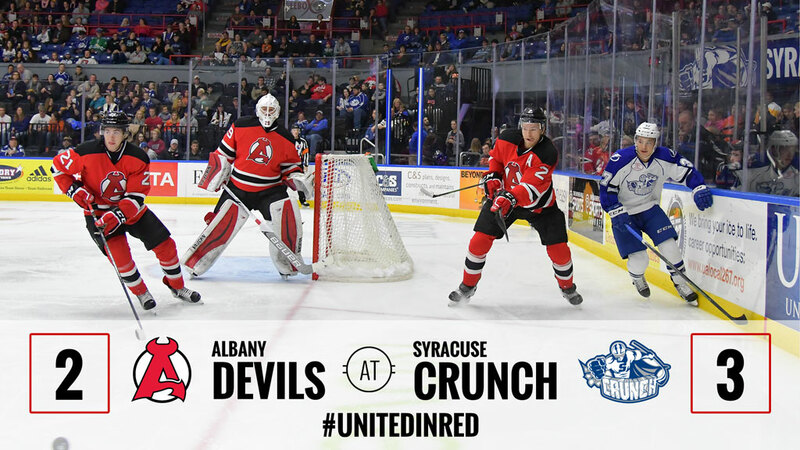 With the win, the Crunch (8-4-0-1) jump the Devils (9-6-0-0) for second place in the North Division standings. Brandon Gormley and John Quenneville both scored, while Mackenzie Blackwood made 27 saves on 30 shots. Scott Wedgewood was expected to start Saturday’s game, but an injury suffered Friday put him on the shelf. 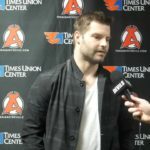 Ken Appleby was reassigned from Adirondack (ECHL) before the game and served as the backup. For Syracuse, Matt Taormina and Tanner Richard also scored and Kristers Gudlevskis registered the win with 29 stops on 31 tries. 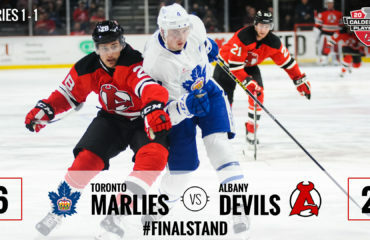 For the second straight game, the Devils found themselves behind early. 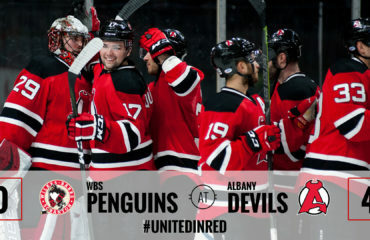 Taorimina – a former Devil – opened the scoring at 2:34 of the first and Tannar Richard followed at 4:06. 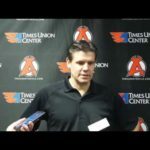 However, Albany found a response first off the stick of Brandon Gormley at 8:44 and then thanks to John Quenneville at 14:34. 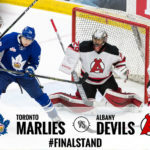 Gormley’s tally, which was assisted by Max Novak and Petr Straka, was his first in an A-Devils uniform. Quenneville registered his fifth goal of the season, giving him three points (1g-2a) in the last three contests. 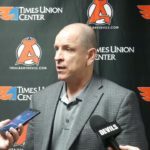 Joe Blandisi extended his point streak to five games (3g-5a) with the primary assist and Josh Jacobs posted his first career point with the secondary helper. 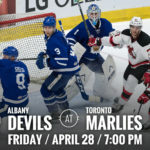 Next up, the Devils return to Times Union Center for a 7 pm faceoff against the Toronto Marlies Tuesday.